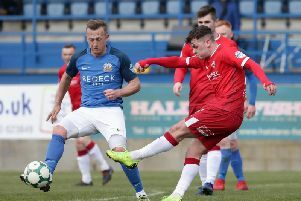 Coleraine FC have agreed contract extensions with promising young stars Brad Lyons and Lyndon Kane to tie them to the club for at least the next two seasons. The duo have become integral players in Oran Kearney’s first team squad since making the breakthrough from the Reserves. “We are delighted to have extended both Brad and Lyndon’s contracts with the club,” said Kearney. “They have been exceptional for us since making the step up, their progress has been fantastic, and I can’t praise them highly enough for the hard work they have put in to achieve that. “They are a joy to work with and they have a major role to play in the future of this club. Both players have agreed one-year extensions which will keep them at The Showgrounds until the end of the 2017/18 season.